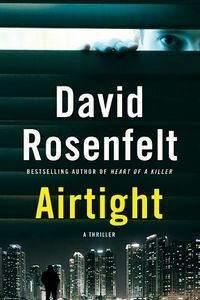 Airtight by David Rosenfelt, a Mysterious Review. Review: Superior Court Judge Daniel Brennan has seen a lot of cases cross through his courtroom, from business fraud to drug offenses to murder. And his sentences could be harsh. So when he is found murdered in his garage, stabbed no less than 37 times, it seems at first that a very angry someone may be getting back at him for something they found unjust. New Jersey detective Lucas "Luke" Somers is assigned the case and quickly identifies a potential suspect: Steven Gallagher, an erratic young drug user, who was soon to be sentenced by the judge. When Luke takes him in for questioning, Steven pulls a gun; Luke kills him in self-defense. Case apparently closed. Or not. Steven's older brother Chris, who believes that Steven was framed, abducts Luke's younger brother Bryan, imprisoning him in an underground room with enough food, water, and air for seven days, enough time he believes for Luke to identify the real killer in Airtight, a stand-alone thriller by David Rosenfelt. Airtight is a thrilling mystery, one that uses two plot devices to ramp up the tension: a clock ticking down to a deadline and a claustrophobic setting, in which all one — and innocent of the circumstances — young man can do is hope that his brother comes through for him. In a very real way, Luke and Chris are more alike than different; both are brothers, who care deeply for their younger siblings, each caught up in a situation not of their own making in which the younger brother is at risk due to a situation not of their own making. One innocent man is already dead. Will another innocent one die, too? This is a solidly plotted, very exciting thriller that will have readers anxious to learn how it plays out. Special thanks to guest reviewer Betty of The Betz Review for contributing her review of Airtight. Acknowledgment: Minotaur Books provided a copy of Airtight for this review.